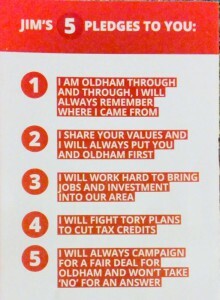 The latest Labour Oldham leaflet for Jim McMahon gives his “5 pledges to you” which either insultingly treats everyone as a single generic Oldham persona all receiving tax credits and all with a singular set of values that Jim has identified or is a targeted leaflet aimed at people Labour consider to be their core Oldham voters. We think it is great to see Jim all but admit what we always knew about his politics, which offers disproportionate allocation of policy implementation & spending in core demographic areas for core Labour voters. He also goes on to state he “created 2,100 jobs” but neither offers up any evidence for this or communicates the public expense involved. 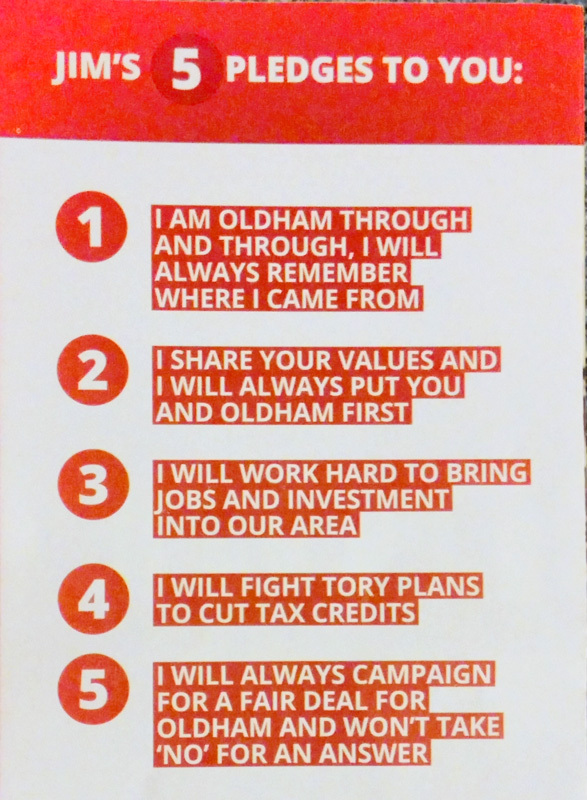 Also missing from the leaflet is that there have been 674 Oldham Council redundancies under his tenure up to April 2015 and a 5,267 increase in overseas nationals registering for new national insurance no’s in Oldham. Migrant numbers arriving in Oldham have increased every year since Mr McMahon became leader of the Council and many of the main areas of this population increase mirror the areas of regeneration spending. More than 1 in every 4 Oldham homes claims tax credits and Oldham has the highest average award amount in all Greater Manchester. Oldham West and Royton has the tenth highest average award amount for combined working tax credit & child tax credit in the UK, the parliamentary constituency has 5200 people receiving an average of £10,147 per annum or a cumulative £52.8 million of tax-payers money every year. 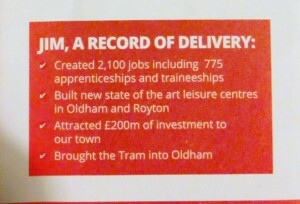 We have also seen this “attracted £200 million of investments” claim on various Labour documents, websites and slideshows yet we have never seen a list, breakdown or indictors as to where this investment has been made or how much of the Council’s public sector money, central government grants or charitable donations was used to attract it. 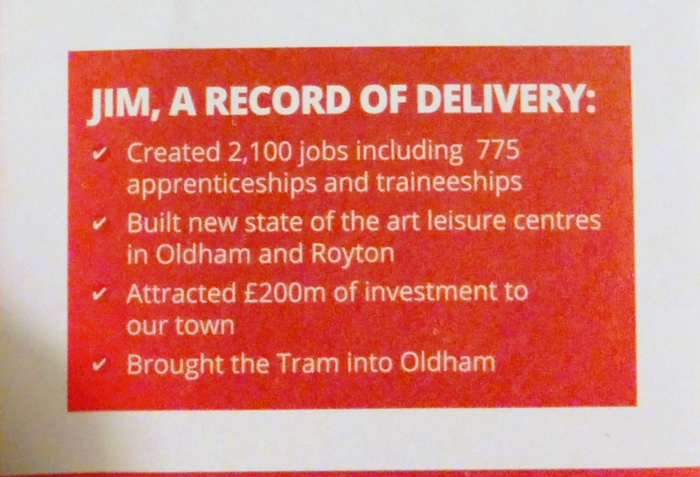 The two new state of the art leisure facilities have been built using PFI loans adding to Oldham’s huge debt repayment bill. The flagship Oldham leisure centre offers less sports participation facilities but more spectator seating than the centre it replaces and has been built in a location to serve the educational campuses rather than tax payers of Oldham. When Greater Manchester tried to introduce the congestion charge the people of Oldham were told if they rejected the charge the tram would only be built with a stop at Mumps avoiding the Town Centre all together, people unanimously voted against the congestion charge. Last year during a crackdown on people not buying tram tickets 85% of passengers checked at Oldham’s flagship King St stop had no tickets. In July 2015 police had to launch a crackdown on trams being vandalised in Oldham after many had their windows smashed as they passed through Failsworth and drivers began refusing to work on the Oldham line.